I have friends who visit Cornwall regularly. They watch the dark clouds forming as they pull onto the motorway and as they drive south and west they can see the darkening horizon blurring in the gathering mist. It has becomer a joke for them as the rain clouds form overhead. It would be easy to think that the weather had a plan, and not a particularly amicable one. In that vein I watched the skies clear this week and the sun come out. I also watched my diary with interest - not a single space to sit in the sun, even for a minute. Temperatures have been high through the day, the ground is dry, the greenhouse is hot. Summer in all but name. Watering the greenhouse has returned to the list of tasks that fill daylight hours. Plants have responded to the weather with enthusiasm. 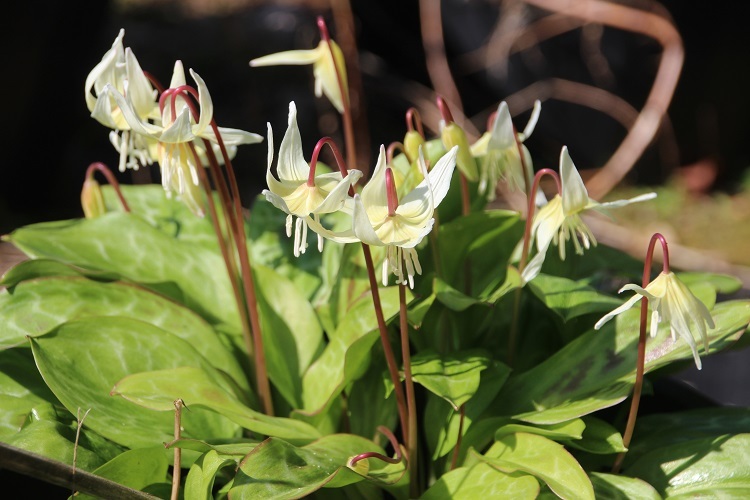 The Erythronium were opening cautiously last week, now they are hastening to perfection. I am a little worried that they will go over with the same speed, the ground is dry around them and the petals look very fragile. Erythronium californicum comes from northern California where the heat and sunshine should make my garden feel gloomy, but it chooses moist mountain woodlands. The dry shade under my trees meets with toleration rather than approval. It has been a peculiar year already. The daffodils should be at their peak by the end of March but instead they have faded. A warm spell through February hastened the growth and the last week or two have put an end to all but the latecomers. It is difficult to know what will apear next. Anemone nemorosa, elfin darling of the woodlands, has appeared in flower and already the blooms are starting to look distressed. A good shower would help, for all the inconvenience. 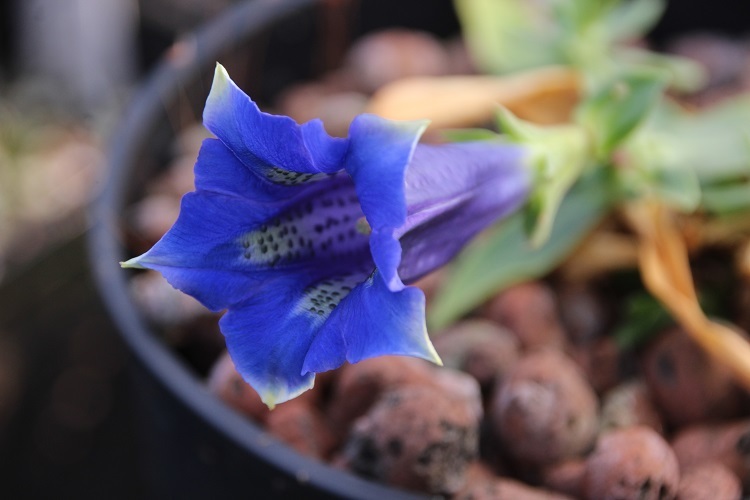 Most peculiar has been the arrival of a flower on Gentiana acaulis. I have a very simple relationship with gentians, I buy them and then they die. I had reached the point that I didn't feel the need to prove that any more however for some reason a seedling of Gentiana acaulis cried out to me last year, and I brought it home to its doom, as I thought. I was surprised that it survived the summer, astonished that it came through the winter and rendered almost speechless by the flower. I think that is what gentians are supposed to do. I have no idea what happened. Off the top of my head I think this is the first time a gentian has flowered for me (if you don't include those that were in flower when I bought them). It has a widespread distribution in the mountains of central and southern Europe, perhaps it was just enjoying the sunshine. Pinguicula grandiflora x vallisneriifolia . The mountains of southern Europe are also home to an assortment of butterwort species, though I haven't had a lot of success with them in the long term. P. grandiflora has been an exception, its range includes the Republic of Ireland ands parts of the UK. I have never actually found it in the UK (and I have looked) but I am prepared to accept that it is so. It grows in wet grassy habitats and has adapted well to the Sarracenia trays, seedling about inoffensively. P. vallisneriifolia is more of a problem. I can keep it for a few years but a hard winter kills it. It comes from the mountains of southern Spain and seems to suffer in bleak winter weather even though it is dormant. The hybrid between the two species is rather easier and produces fertile seed, so it has also seeded around. 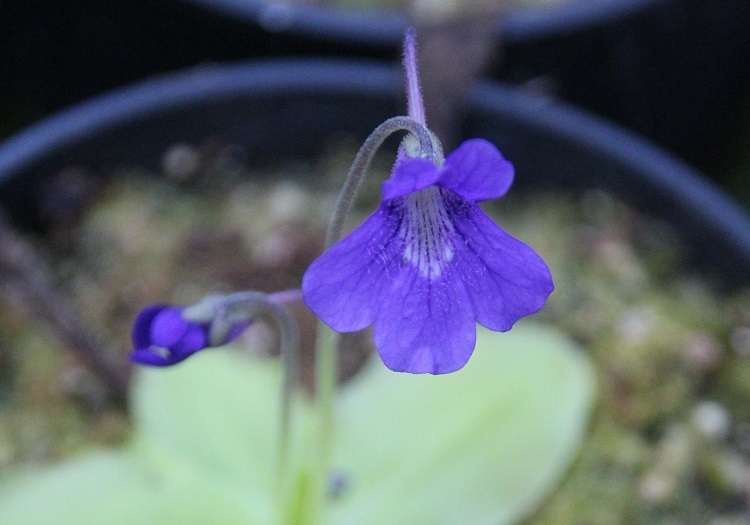 My population of small purple Pinguicula probably contains a number of hybrids. They seem to have more open-faced flowers with less contrast between the corolla and the eye of the flower than P. grandiflora but it is possible that I am just seeing what I want too, I haven't tried any objective assessment. In theory I also have a pink gene washing around in the population but it has never floated to the surface. 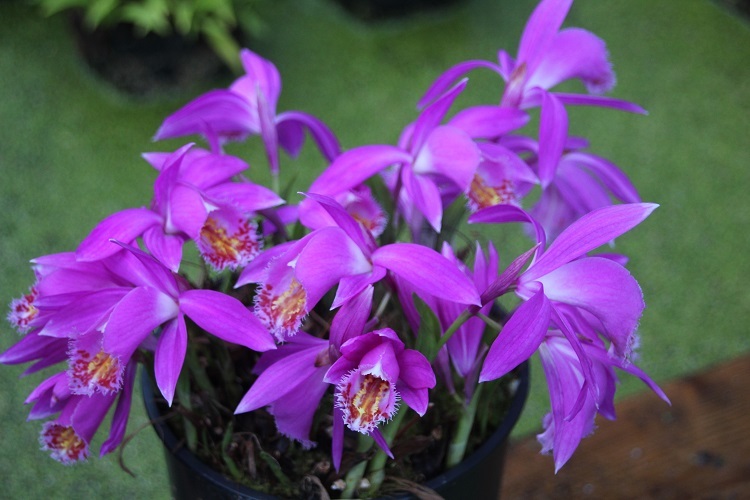 The Pleione have take the sunshine as their cue to perform. The flowers should last for several weeks, so I think the peak is still a week or so away but their benches are pink and white in a very satisfying way. I have the collection split into two halves in two different greenhouses and I mean to have duplicates in each part. Somehow the administration required defeats me in the sunny weather. It would be easiest to check when they are flowering but it will have to wait until the winter. I keep finding things flowering and wondering if I have them on the other bench. It is a distraction. Fortunately they seem to be growing well in both locations. I divided them when I was interested in improving my cultural technique. All I have learned is that they don't like to dry out when they are growing and I already knew that. I bought a number of new cultivars through the winter. There are some fantastic orange colours appearing now, along with new flower shapes. Sadly I have a nostalgic streak that means I bought a lot of rather ordinary things I grew as a teenager. I console myself with the fact that they are vigorous and P. Tongariro 'Jackdaw' demonstrates what a good attribute that is. It is making a fantastic display, filling the pots with flowers and increasing enthusiastically. Whatever the weather it has never let me down, a reliable ray of March sunshine.